To get the best performance from your ULINK JTAG adapter, it's important to set the JTAG clock rate for the MCB2929 board. The following steps show you how this is done. Power up the MCB2929 Board. In µVision, Configure the Debugger in the Project — Options for Target — Debug dialog. Use the Options for Target toolbar button and click the Debug tab to display the Debug dialog. Select the Use: radio button and then ULINK ARM Debugger in the drop-down list to choose the ULINK USB-JTAG Adapter as the debugging tool. Click the Settings button to open the ARM Target Driver Setup dialog. The Max JTAG Clock drop-down list sets the highest JTAG clock rate used to communicate to the target board. When using a ULINK adapter, the 1MHz setting works best with the MCB2929 board. 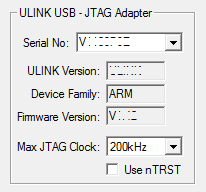 ULINK2 JTAG adapters support the Return Clock (RTCK) pin available on the MCB2929 board. The RTCK signal adjusts the JTAG clock speed to the highest setting for that device. If you have a ULINK2 adapter connected to your MCB2929 board, set Max JTAG Clock to either 1MHz or RTCK.